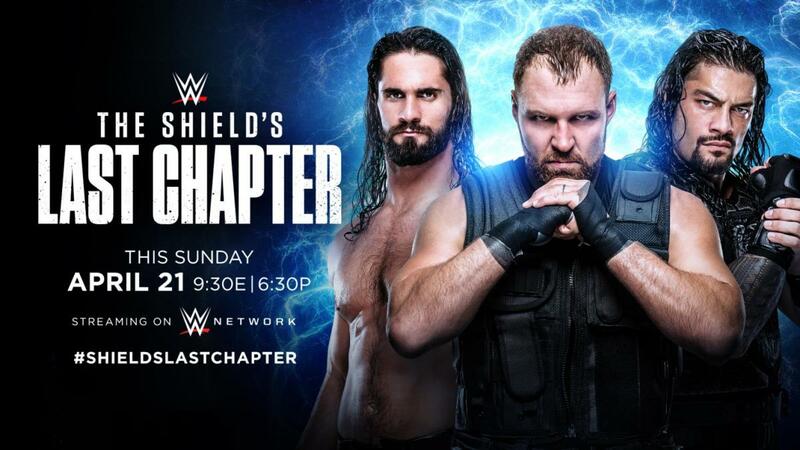 WWE is promoting that The Shield's final match as a trio will stream live on Sunday night. "The Shield's Last Chapter" will air live on the WWE Network at 9:30 p.m. Eastern time on Sunday (April 21). It will feature Roman Reigns, Seth Rollins & Dean Ambrose's final match as a team, though WWE has yet to announce their opponents. An Intercontinental title defense by Finn Balor will also air on the broadcast. His opponent is to be announced. Raw's Sunday night house show is taking place at the TaxSlayer Center in Moline, Illinois. The Shield held a sendoff for Ambrose after last Monday's Raw in Brooklyn, New York went off the air. Dave Meltzer reported that Ambrose is at the Bell Centre in Montreal, Quebec, Canada for tonight's Raw. Ambrose's contract with WWE expires this month, and WWE confirmed in January that he will be leaving when his contract is up. The Shield most recently teamed together in the main event of March's Fastlane pay-per-view, defeating Baron Corbin, Bobby Lashley & Drew McIntyre. That was also promoted as Reigns, Rollins & Ambrose's final match as a team.